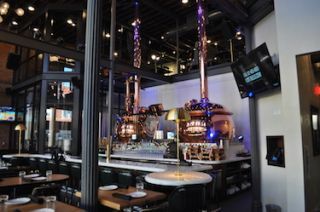 Encompass AV recently deployed CDD and a range of other Martin Audio speakers for the newly built Tangled Roots Brewery, as part of a complete renovation of a historic building site that includes a high end restaurant and bar with a performance space alongside a brewery, adjoining tasting room, and private meeting spaces. The Lone Buffalo restaurant on site specializes in “slow food” from the Brewery’s own farm and has a small stage for local country, classic rock, bluegrass, acoustic reggae, and roots artists. To effectively provide background music for the restaurant, Tim Pickett and the Encompass AV team mounted 12 Martin Audio CDD8s around the walls complemented by two AQ210 subs under the booths. Live performances employ a Martin Audio PA consisting of two flown XD15s and two CSX218F subs above the stage. The tasting room, located next door to the restaurant, is equipped with 10 Martin Audio C6.8T in-ceiling speakers along with two CSX212 subwoofers in the front and back of the space. The rest of the sound system includes a combination of Lab.gruppen and Martin Audio amplifiers and Symetrix Radius digital signal processing. The video system is comprised of Philips BDL5530QL and Sony XBR-65X850C displays with a Just Add Power Network Video System.